Properties in Tirohanga average 4.5 out of 5 stars. Property 3: Retro Bach + Fresh Water Hot Tub or Plunge Pool. Family Friendly Beach Bach - Pets can come too! Property 4: Family Friendly Beach Bach - Pets can come too! Property 11: Ohiwas' Best Bach, Clean, Cosy and Private. Property 12: OHIWAHEAVEN True traditional Kiwi Bach Secluded!! Fruit Forest Studio accommodation - longstanding organic property, ocean views. Property 17: Fruit Forest Studio accommodation - longstanding organic property, ocean views. 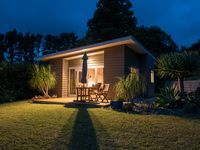 Property 26: Modern 5 Bedroom Beach House in Ohope! We loved our stay at the cottage. It had everything we needed for a peaceful two night stay, and had a friendly greeting from our host. We would definitely stay again.